Even while climbing mountains, a Jacksonville doctor always answers his phone. And his patients never outgrow him. Charles Martin is the kind of pediatrician who doesn’t mind taking calls from concerned parents when he’s off-duty. Sometimes, he takes those urgent calls while he’s halfway up the world’s tallest mountains. Martin, 78, has treated generations of people in Jacksonville. Currently, his oldest patient is 48. “No, really,” he says. Martin may be the only pediatrician in the state who might need to consider accepting Medicare. “I can’t imagine he would ever turn anyone down,” says Linda Davies, a good friend. And they keep calling, no matter where Martin might be. At the wedding of his godchild nearly 15 years ago, a friend asked about Dr. Martin’s summer plans. He didn’t have any. “What about climbing a mountain?” the friend asked. That mountain was Kilimanjaro, which, at 19,341 feet, is the tallest in Africa. Martin has climbed it five times, summiting three times. He’s visited base camp at Mount Everest, which stands at 17,590 feet. He’s climbed the 16,854-foot Mount Ararat in Turkey, where Noah’s Ark is believed to have come to rest. He’s climbed the highest peak in Europe, Mount Elbrus in Russia, which rises 18,510 feet. He’s been climbing in Bolivia and Argentina, too. When you ask Martin about the trips, he doesn’t talk about the mountains. He talks about the people. 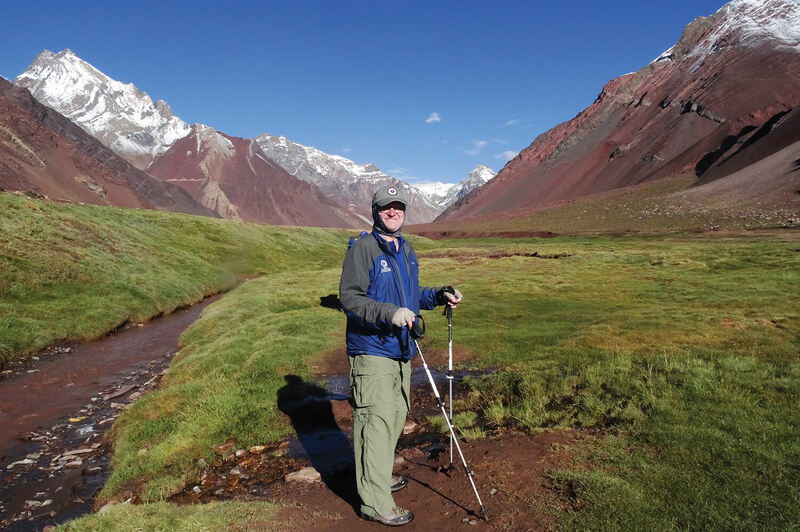 Martin prepares for a 13-mile ascent toward Camp Mulas in the Andes Mountains in Argentina. The former 82nd Airborne paratrooper has slept in the crater at Mount Kilimanjaro. But he’d rather tell you about the perspective he’s gained from making friends around the world. That impact continues long after Martin leaves the mountain. In Tanzania, he watched as schoolchildren hauled water in a wagon for four miles on a dirt road. When he returned home, he joined some friends to raise money to dig a well near the school. The duo has a simple goal for the near future: When Martin heals from a broken leg, they plan to return to Nepal. As he approaches 80, Martin has mountains left to climb and new friends to meet. Adam Lucas is the author of seven books about North Carolina basketball. His latest, Redemption, about the 2017 Carolina basketball national championship, was published in October 2017.